Don’t miss out on Ironweakness’ take on the subject. When my current favourite game, Star Wars: the old republic, activated the bonus experience gain for class quests, i was excited. With this bonus, a max-level character seemed to be within my grasp in a reasonable amount of time. 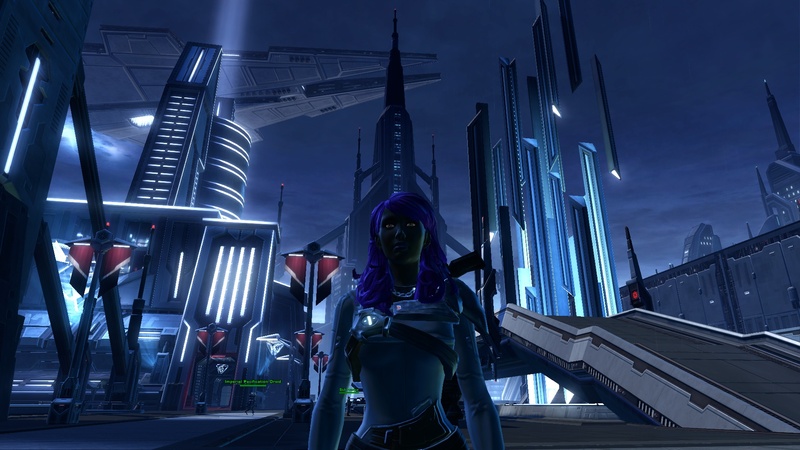 I enjoy planetary questlines, but the possibility to have one character at the level cap quickly was a very welcome one- credits would roll in faster, i could experience the most recent content additions and might even be able to join a guild and be able to play with the other members. Unfortunately, it didn’t quite pan out that way. Mind you, this is from the perspective of a player who hasn’t ‘done it all’ on another character but tried to play his first character to level cap with the 12XP bonus activated (i didn’t come far, but that’s mainly because of a kindergarten/nursery strike going on here). Our last topic in the Dual Wielding series was all about the leveling process. My take on that involved a lengthy process, neverending at best, that accounted for all activities being provided by the game while still being heavy on the story side, giving weight to content, providing choice and not turning around when endgame comes. If we take a look at 12XP with these entries in mind, you can already see the problems i am facing with it. Leveling with 12XP activated is a quick affair. When i was using it, i felt like hurrying from quest(hub) to quest(hub), sometimes gaining even two levels for returning one class/story mission. Usually, the rotation went like this: get the story quest, go into the area where it takes place, finish the quest, return the quest, visit the class trainer, read about the new abilities, continue through the storyline. While this isn’t exactly like buying a high-level character as a newbie in Everquest 2, related to the skills, it did have similarities. Sure, i was reading what the new abilities were doing, but i couldn’t really test them- in the early stages, you would outlevel even the class quests quickly. Reading alone doesn’t provide a lot of insight- after a while, i didn’t know what my skills were doing. Now…why are spaceships in the Star Wars making sounds when in space yet seem to be of no disturbance hovering over big cities? Now, this might change a bit later on, and maybe there are class stories that are more centered around fighting and allow you to experiment with your skills, but muscle memory won’t build up. With 12XP, SWTOR becomes what i call a “quest grinder”. There are some really great and interesting games out there that i have trouble to connect with because they’re basically all about questing. If you read everything, immerse yourself in the questing experience and go off-the-rails on your own from time to time, there might be some variety to be experienced anyway, but these games (Lotro and TSW, for instance) are basically all about the questing. After a while, this bores the heck out of me. 12XP isn’t forcing itself on you- you can deactivate it or apply other work-arounds to lessen the effect it has on your leveling experience- more on that later. But if you were to make full use of it, you’d just do the class quests. I read that you can experience the class story this way in about 10 hours of playing, but it would take me longer, personally. Crafting falls off the side in this case- of course, you could still try and level your crafting by sending your companions out to gather resources, but all by yourself and by only doing class quests, you’d be very short on resources. Also credits. The characters i played with 12XP in mind were broke. This, of course, is the strong side of 12XP. If you don’t care about planetary storylines because you’ve already experienced them, playing only class quests is an interesting affair, story-wise, since there are no interruptions. One quest leads up to the next, the story is focused, you don’t have to play hours worth of other quests or flashpoints to continue with the next step. 12XP allows you to stay connected to your class story. 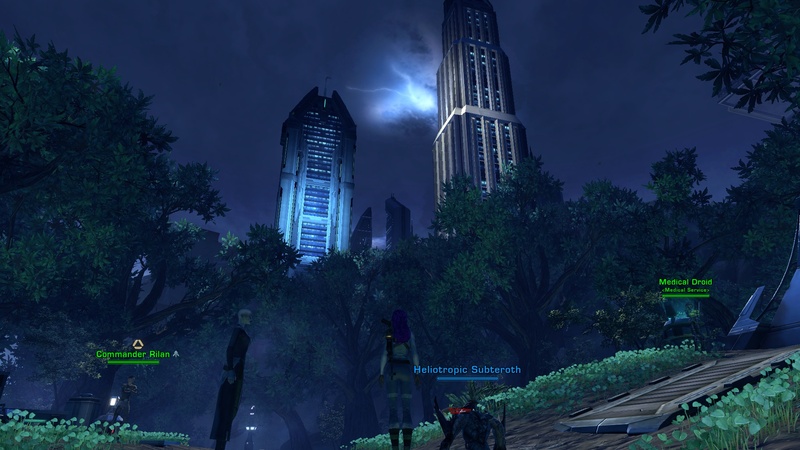 In another edition of Dual Wielding, Ironweakness and i were discussing the viability of SWTOR as a resident MMO. Its’ strong points, in my opinion, were that the game makes use of the ingame currency, credits, and lets you spend it in many interesting ways and that by now, there’s a variety in content. The game is still a bit thin when it comes to non-combat activities, but there are strongholds and outfits, at least. One could also venture forth and go achievement hunting or fly a spaceship into battle. Unfortunately, 12XP renders everything besides the class quests as side-content. Everything else is still there, but it isn’t even ‘optional’ anymore, basically everything else enters hobbyist territory. For me, and going by the hints given by Ironweakness in some of his other posts, for my partner-in-dual-wielding as well, that made a huge dent in our enjoyment of the game. Nobody is forcing us to use the buff, of course, but deactivating it feels wasteful. Doing anything else besides class quests does, as well. While we do know 12XP is going to be around for a while, we don’t know how long it’ll be, exactly. In my case, i’m wondering if i’m able to level one class in the traditional way before moving on and play another class with 12XP. 12XP is not the experience bonus i was looking for- as a matter of fact, i prefer 2XP- it gives a faster levelling experience without rendering everything outside of class missions “useless”. There are ways around that, of course. You could deactivate the bonus, but it really seems to be a waste. In fact, i think that allowing to play through the game and being able to sometimes skip a planet or a dungeon is helpful in keeping the game fresh for alternate characters. Another way i could think of is doing class quests only when they give less experience. Unfortunately, i lacked the time to test this, but if you’d, maybe, outlevel class quests by two or three (or four?) levels before finishing them/turning them in, they’d still give a considerable xp boost without rendering everything else a hobby. Finally, you could also do them last- move to the planet they send you to, do the planetary story quest first (i received a hint by Shintar; just take all quests in the first hub of the planet, finish them all- there should be one quest left that sends you out to the next hub: this would be the planetary storyline) and then move on to the class story. This way might turn out to be similar to the previous one, but it is only viable for PvE-quest-players. Personally, i think i’ll try all of these options, as well as playing with 12XP, on different characters. After all, i am willing to play the Trooper, the Sentinel, the Imperial Agent and another class (maybe Smuggler or Inquisitor), so i’d have enough characters to play around. Remember, though, that this is coming from someone who hasn’t leveled to cap yet- if you already have, and experienced all the planetary content and/or can dash through the class stories quickly (as in 1-2 weeks, maybe), you can find enjoyment in playing with 12XP- the side-activities would be there, waiting for you and you’d even have credits to play around with them. If you take longer because of available time to play or because you enjoy doing this-and-that while playing, you might be better off by turning 12XP off. You’d think we got together beforehand and planned what we rere going to write, our responses were so similar, right down to preferring double XP. Overall I agree though, as nice as it sounds on paper it’s not all that great for a first time leveler. Speaking of, what level were you when you started with the bonus XP? Or did you start a new character? I can’t remember. I was level 35 and so I really haven’t had issues with credits or basic comms, at least not yet. I just reached 50 last week and spent about half my money gearing my companion and the remaining slots I don’t have legacy gear for, but still I’ve had enough money. I’m thinking of leveling a hybrid approach next, some 12x, some without.